The Funkoars are excited to announce that on Friday 10th of September, the guys will be streaming their final Adelaide performance of 2010 LIVE! Take a ride with Hons, Sesta, Trials & DJ Reflux as they make their way from Adelaide to Melbourne to Falls Creek and beyond in this 3 part mini-series of Funkoars debauchery! Parts 2 and 3 coming soon! 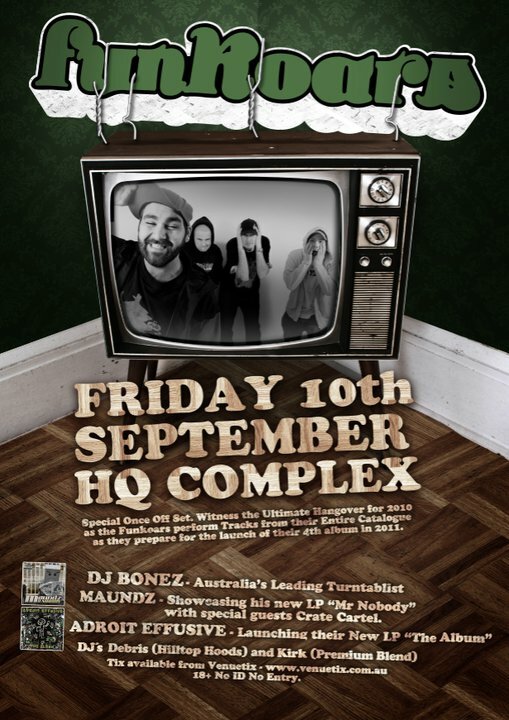 THE FUNKOARS PERFORM LIVE @ HQ COMPLEX – TICKETS ON SALE NOW! After a string of sold out tours and festivals, The Funkoars have been taking a well-earned sabbatical from what was essentially a two-year long hangover. Now after some serious stomach pumping and quality time in rehab, The ‘Oars are ready to deliver their last Adelaide show for 2010. Not only will this mark their final hometown show of 2010, but we will also see The Funkoars performing selected cuts from their back catalogue for the VERY… LAST… TIME. Promising to deliver a world-class performance, The Funkoars have pulled out all the stops – more booze, more women and more of the raw, to give Adelaide the best of the baddest! This will be the quintessential performance of the ‘Oars career, solidifying their position as one of the countries best live acts! Currently buried deep in the studio, The Funkoars have promised to give their city a taste of what’s to come in their long-awaited and highly anticipated new album scheduled for release early 2011. Do not miss this opportunity to punish your liver and beat it beyond recognition with The Funkoars one last time for 2010! Helping The Funkoars deliver the best show of 2010 will be Adelaide’s own Adroit Effusive, launching their brand new album The Album plus Melbourne guests Maundz with Crate Cartel AND a very special performance from the legendary DJ Bonez. On hosting duties is K21 and lest we forget, sealing the SA deal is local DJ’s Debris (Hilltop Hoods) & Kirk (Premium Blend)!